The 32nd and last team to show up on the board of the National Invitation Tournament was the University of San Diego. It’s the first time the Toreros have ever been asked to play in the NIT and they were caught a little off-guard by it. 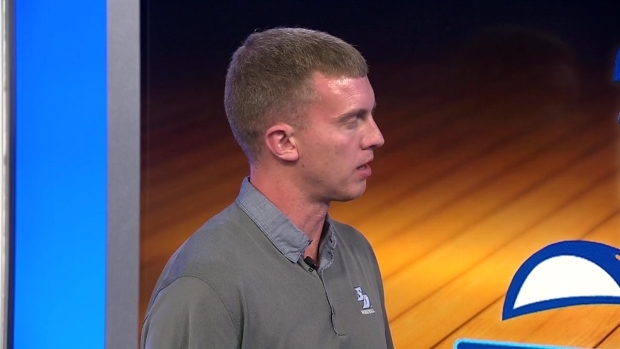 USD basketball coach Sam Scholl talks to NBC 7 Sports Wrap anchor Darnay Tripp about his reaction when the Toreros were selected at the sixth seed for the NIT. USD earned a 6-seed and will play the Memphis Tigers, who are coached by former NBA star Anfernee “Penny” Hardaway, on Tuesday night in Tennessee. Once the excitement of being included in a post-season tournament subsided a bit the Toreros got to work. They didn’t have much time to put together both a game play and a travel plan. Memphis likes to light up the scoreboard. The Tigers average 80.6 points a game. But during the West Coast Conference Tournament the Toreros were playing their best defense of the season, allowing just 17 points in the 2nd half against Portland and 16 points in the 1st half against Santa Clara. It’s nearly impossible to fully prepare a team in the amount of time USD has so they’re going to in large part just go back to their roots and let instinct take over. “We don’t know much about Memphis,” said Carter III. “But I’ve been playing basketball since I was in 2nd grade so I’m just going to go out there and play with confidence like always and let the game take care of itself. If the Toreros win in Memphis they’ll play the winner of the Creighton vs. Loyola-Chicago game. You may recall the Ramblers, who went to the NCAA Final Four a season ago and made Sister Jean, the team chaplain, a superstar. If Loyola-Chicago beats the Blue Jays they’d come to San Diego (hopefully with Sister Jean) for round two. That would be pretty cool.